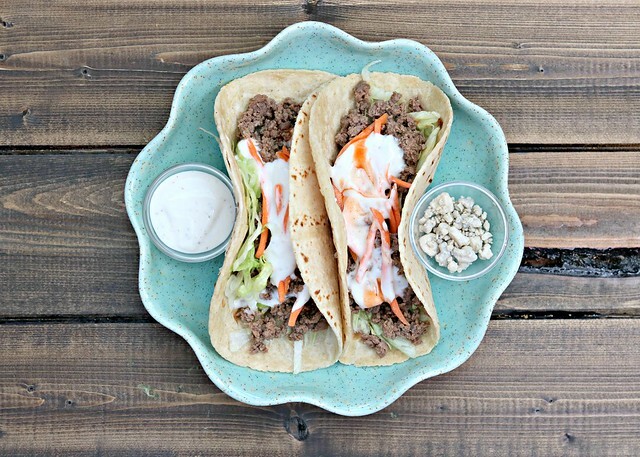 Ground venison tossed in buffalo sauce, wrapped in a tortilla on a bed of crisp lettuce and crunchy carrots, topped with creamy ranch dressing. As much as I love tacos, and as many varieties as I have made, I have a soft spot for good ol’ ground meat tacos. There’s just something about the basics that are so comforting and never fail. And when you have a freezer full of deer meat, a good majority of it being ground, you find 1001 different ways to make your favorite meals using it! 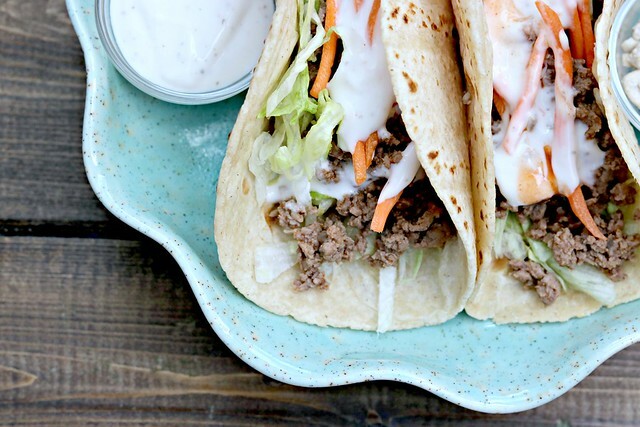 So, naturally, tacos are high on the list, and when you throw “buffalo sauce” into that equation, that is a sure way to spice up a basic ground meat taco. 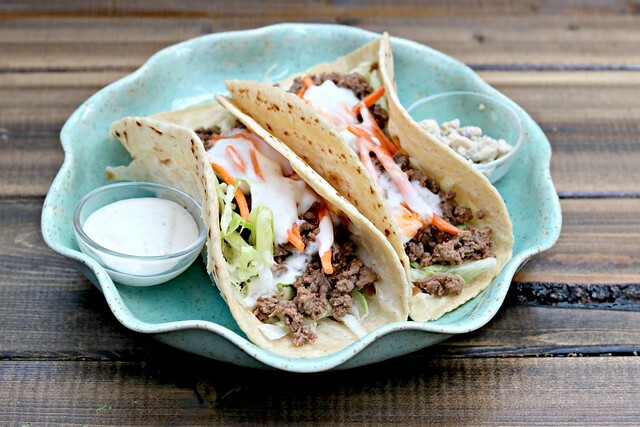 Another perk about ground meat tacos is the versatility of what meat you can use. If deer meat/venison isn’t your gig, you can use beef, chicken, turkey, even pork! You could even use crumbled tempeh if you wanna go the vegetarian route! Any of these, mixed with buffalo sauce, and wrapped in a tortilla with shredded lettuce, shredded carrots, and ranch dressing is going to be a winner! And, if you’re into blue cheese, top it with some of those crumbles and you’re all set. I pulled some of the meat out before I added the buffalo sauce for baby girl to eat, alongside some cooked carrots and diced peaches. She mostly played and flung it all over the place, but she did eat a good bit of the meat despite her dinner-time defiance and refusal to eat much of anything. Silly girl. But we will keep at it. Keep offering and letting her try things (this feeding herself thing is new and she’s not sure how she feels about it…) and depend on the pups to clean up the bulk of her mess. They were very excited about her disinterest in actually eating the food on her plate. I can just imagine when she realizes they are down there and that she can intentionally throw food to them. Maybe by then she’ll remember how much she actually loves to eat, all things food, and stick to that instead. Am I just dreaming there? I know they all do it…but I’ll just stay in denial a little while longer and focus on these delicious tacos instead. And of course, in the interest of hot summer weather, no ovens, and getting dinner made quickly – this is a great option! I had this cooked, photographed, and shoveled into my mouth in under 20 minutes. I mean really…cook the meat, mix in the sauce, and assemble! You’re welcome. Place the ground meat and vinegar in a skillet and cook over medium-high heat, breaking up with a spoon or spatula, until no longer pink. Stir in the buffalo sauce and cook another minute. To assemble, warm the tortillas then top each with a layer of shredded lettuce, venison mixture, carrots, dressing, and blue cheese crumbles if you like. *Red wine vinegar helps to cut the gamey taste from venison. You won't taste the vinegar in the final product.